Our Lady of Tears Catholic Church in Silver City, Idaho. Image courtesy of Our Lady of Tears. 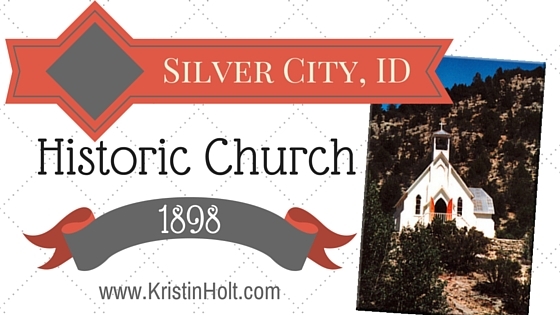 When visiting historic Silver City, Idaho, in mid-June of 2016 with Jacquie Rogers’s Much Ado About Silver City event, we had the privilege of touring the nearly 120 year-old church seated high on a rocky outcropping overlooking the rugged valley. The caretaker, Dave Wilper, allowed us to take pictures and spoke at length about the building’s history, the various groups that had owned the structure, the restoration projects that had been concluded and those (such as shoring up the foundation) that have yet to be done. 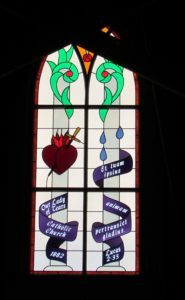 Stained glass window, reproduction and historically accurate, within Our Lady of Tears, Silver City, Idaho. Image: taken by Kristin Holt, June 2016. The present church of “Our Lady of Tears” dates back to 1898. The building started out as “St. James Episcopal Church”. 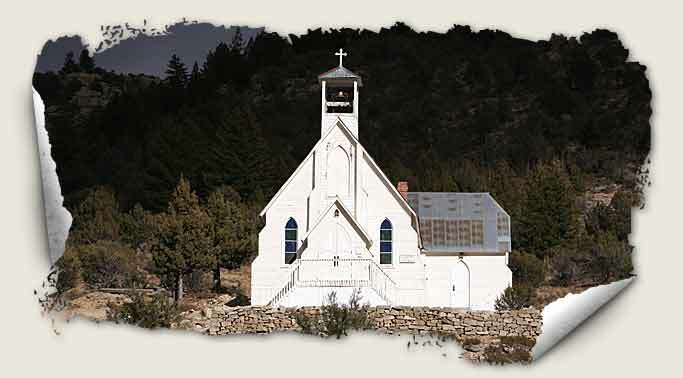 The presence of the Episcopal church in Silver City dates back to 1866… By the 1890’s, the Episcopal Ladies Guild had raised enough money to build a permanent church. and in 1898, construction was begun on the building… St. James served the episcopal congregation in Silver City until the 1920’s. 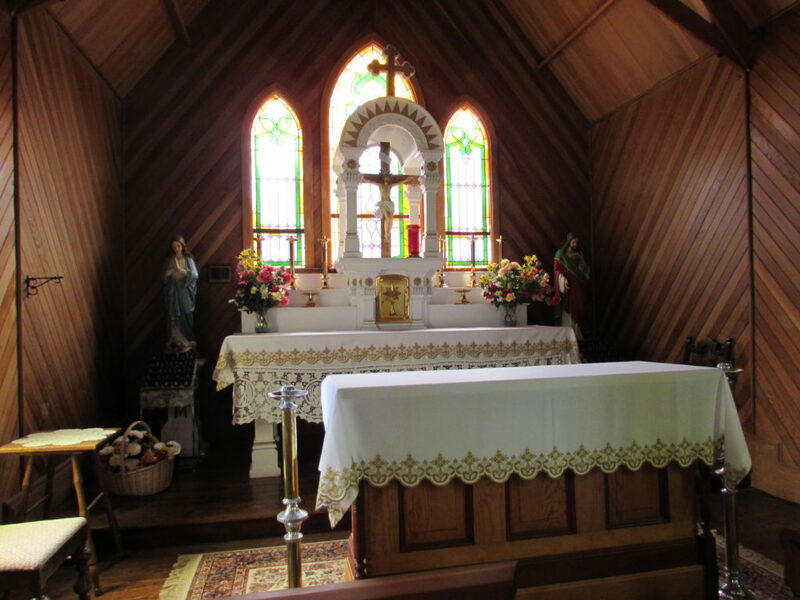 By that time the mining operations had wound down, most of the congregation had moved away, and the building sat alone on the hill, unused… In 1928 the Catholic Diocese of Boise took possession of the building and it was dedicated as “Our Lady of Tears Catholic Church”. For many years the church remained open to the elements and vandals. All of the beautiful leaded glass windows were broken out and the few furnishings that remained were carried off. 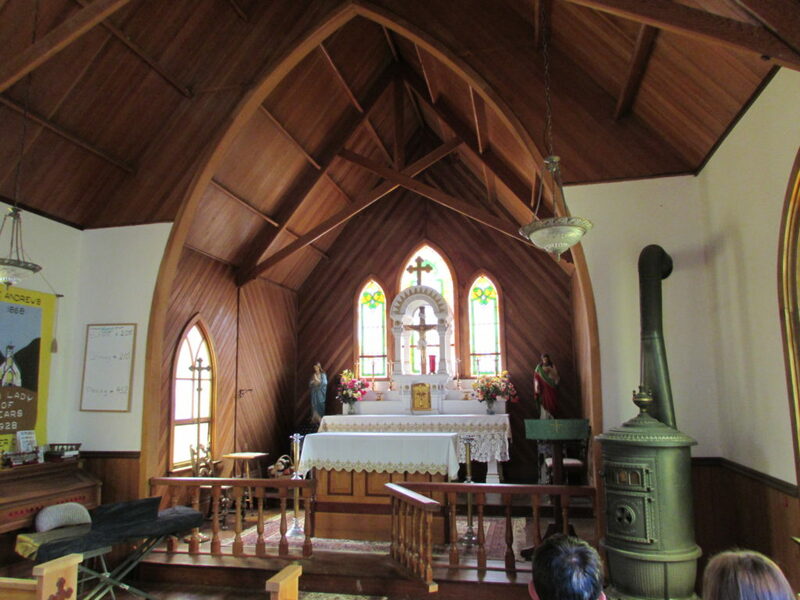 The only things still here that are original to the building are the stove and the small altar in the sanctuary. By the 1950’s the building was in pretty bad shape. Interior of Our Lady of Tears. Image: Courtesy of OurLadyOfTears.org. 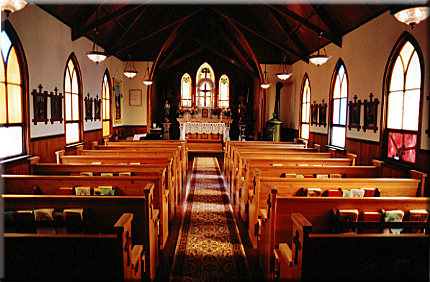 Interior view of historic Our Lady of Tears Catholic Church in Silver City, Idaho. Image taken by Kristin Holt, June 2016. Sanctuary, showing the historical (larger, in back) altar. 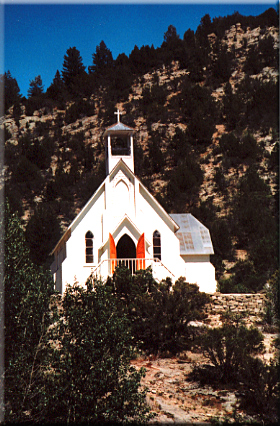 Our Lady of Tears, historic Catholic Church in Silver City, Idaho. Image taken by Kristin Holt, June 2016. The large, ornate high altar in the back of the sanctuary, came from the old church that was torn down in the 1920’s. It survived the Sinker Creek Flood because it had been stored in the back room of this church rather than at the Joyce Ranch. …the pump organ to the left of the sanctuary was also stored here in the church. Through the years we’ve had many things donated to complete the furnishings for a typical mission church of that period around the turn of the century. 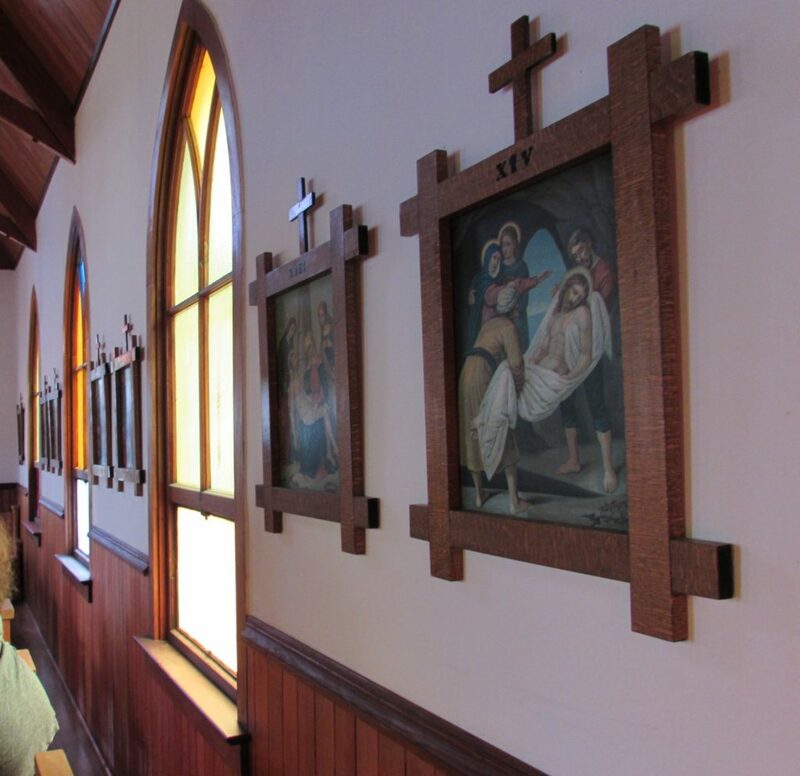 Interior wall of Silver City’s historic Catholic Church: Our Lady of Tears.Image taken by Kristin Holt, June 2016. 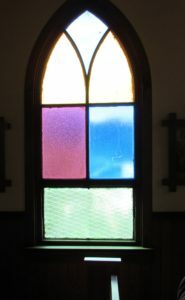 Colored glass windows along the sides of the historic Our Lady of Tears Catholic Church in Silver City, Idaho. Because of the nature of the building and climate (shifting and settling), the windows are frequently broken. Replacements are true to history.Image taken by Kristin Holt, June 2016. Dave had wonderful knowledge of the church and the rebuilding and maintenance of the wonderful building. The workmanship and beauty of the church was wonderful to see. Great post! I agree–Dave’s knowledge of the history and all the restoration work made for a fascinating visit. I’m so impressed with the preservation efforts of this magnificent building. Thanks for stopping by and contributing to the conversation, Paty. I don’t know. The good news is the town’s occupants (a few in the winter, and about 35 (?) in the summer) are very knowledgeable. The church has a caretaker who provided our group a tour. I recommend contacting the folks at Silver City for an answer to your question. One of my related blog posts about Silver City (see the related links at the bottom of each article page, or search with the magnifying-glass icon) provides contact information in the form of a scanned brochure from Silver City.